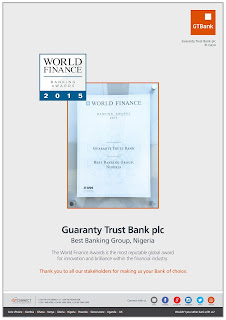 Foremost African financial institution; Guaranty Trust Bank plc has once again reaffirmed its position as a leading African financial institution after being named the Best Banking Group of 2015, Nigeria, by the World Finance Magazine, a publication reputable for providing comprehensive coverage and analysis of the financial industry, international business and the global economy. Since 2007, World Finance has been celebrating achievement, innovation and brilliance in its annual awards. The judging panel boasts over 230 years of financial and business journalism, supported by a research team that works round the clock to ensure our award winners are the most deserving in their sector. It is tailored to provide a comprehensive analysis of the very best in each market. He further stated that, “Our goal is to maintain our position as a leading player in the Nigerian financial service sector, while expanding our franchise in select, high-growth African markets where we believe we have competitive advantage. We will pursue this strategy by ensuring we provide our customers with superior banking experience by prioritizing innovation, integrity and excellence in service delivery. 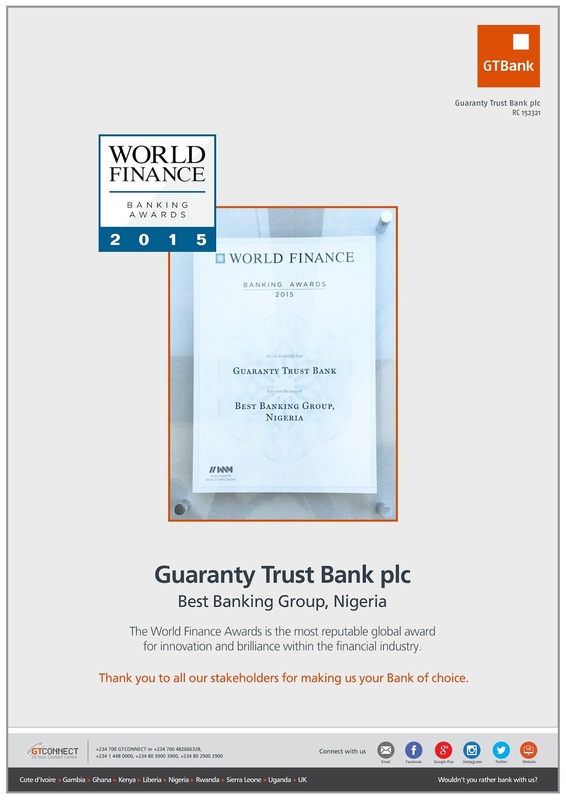 The GTBank brand is regarded by industry watchers as one of the best run financial institutions across its subsidiary countries and serves as a role model within the financial service industry due to its bias for world class corporate governance standards, excellent service delivery and innovation.